Discussion in 'Tank Journals' started by georgec, Feb 5, 2019. It's been up and running since the end of December. I decided to downsize from my 40 breeder with sump to an AIO tank. The 40 had been up for a number of years and was too much for me to keep up with. While I know a smaller tank needs more careful watching, I'm hoping that it will also require a scaled down maintenance regimen. Lighting: Using an OceanRevive Arctic-S026 LED fixture. I had two of these over my 40. I made the mistake of not turning down the intensity when I switched it over to the new tank. I went on a business trip that first week, and came back to all my LPS being fried. Lost about 20 heads of Frogspawn, some Acans, and almost an entire colony of war colony, but the last few eyes seem to be hanging on. Needless to say, the lights are turned down almost all the way right now and everything seems a lot happier. Top Off: Homemade breakout box with float switches attached that control Aqualifter pump. Some pics of the current inhabitants. Hoping to add some more zoanthids and maybe some frogspawn or candy cane to replace the ones that got bleached out. Thinking of a cleaner shrimp next, and debating between a skunk or a fire shrimp. Welcome! I like your custom lid. Good move replacing the IM pump with a quieter more reliable one. nice looking set up! no fish? 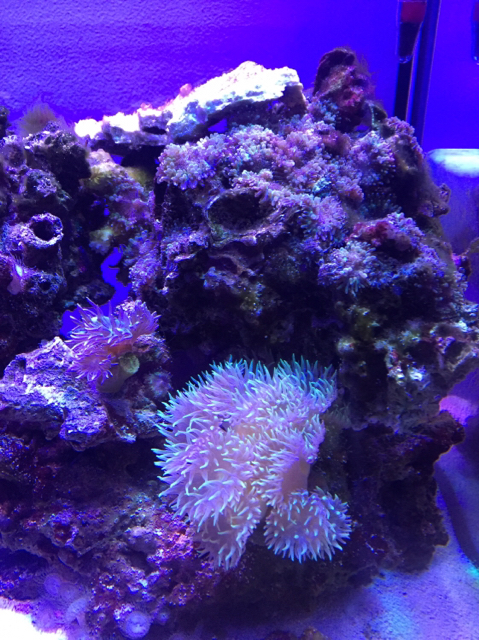 @Coral reefer - keeping my fingers crossed on the RBTA. 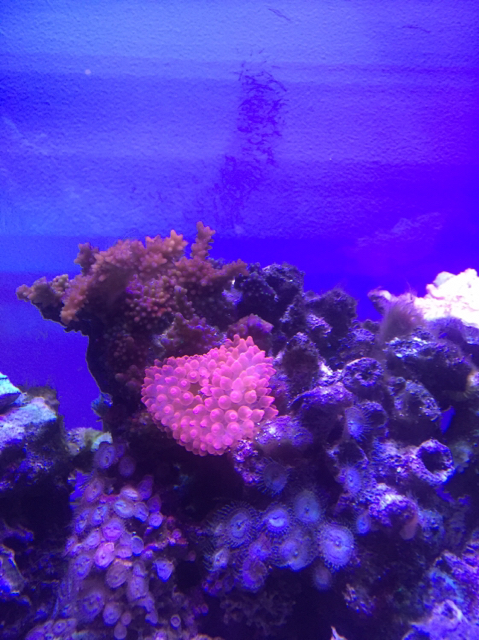 I had it on an “island” in my 40 (not possible in this new tank) and it hadn’t moved for a long time. It’s been creeping around in the 14 as it’s been getting settled in. Are you in SF? Would be interested in the frogspawn. @glee - fish will come soon. I didn’t have any in my 40 for a long time because it was a bit neglected and I’ve also been wanting to downsize for over a year and waiting until I actually went through with it. Searching for some interesting nano fish options. Planning on keeping it very lightly stocked. Finished up some big to-dos today for the tank. 1)I finally finished up the shelf inside the built-in that my new tank is setup on. 2)I then organized all the cables. I know it looks like a mess of cables, but everything is attached to a cable clip. All the wires coming down have a drip loop. 3) Finished setting up my top-off by adding a spare filter canister that I’m using for kalk. I put a tube inside so the top off water flows down and through the kalk sludge. Plan on giving it a shake every couple of days too. We’ll see if this set-up keeps enough kalk saturated. 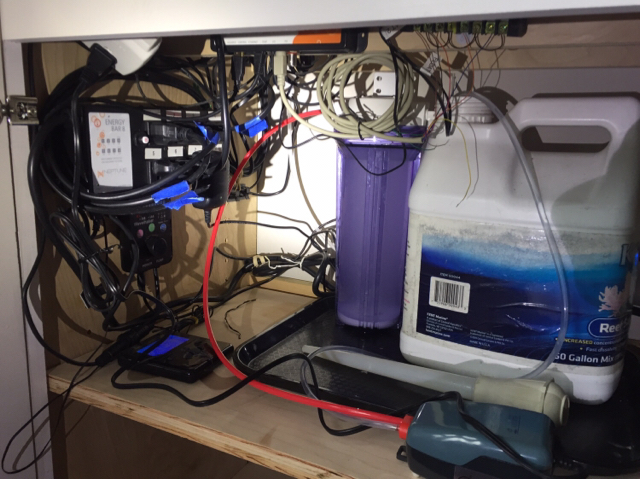 The top-off is controlled by my Apex and two floats in the return chamber of my aquarium (usual set-up: one to trigger the pump and a second as a safety/high shut-off. I just need to get a third float for the water jug to shut-off and let me know if it’s empty. My daughter had a soccer tournament in Hayward today (can we say rain and hail). So, I stopped over at Aquatic Collection for the first time. Definitely don’t have a store like that in San Francisco. I would have gotten a fish, but don’t have time to QT this month. Picked up a few frags for my tank that are sitting in the bottom getting acclimated to the lighting. glee and MolaMola like this. 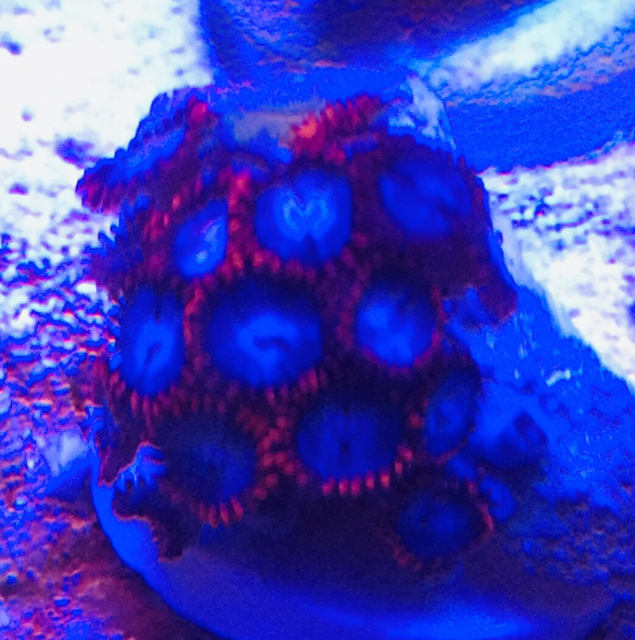 Acans for the second Pic. I haven't been to Aquatic Collection in years. They still have the blue tang with no tail? 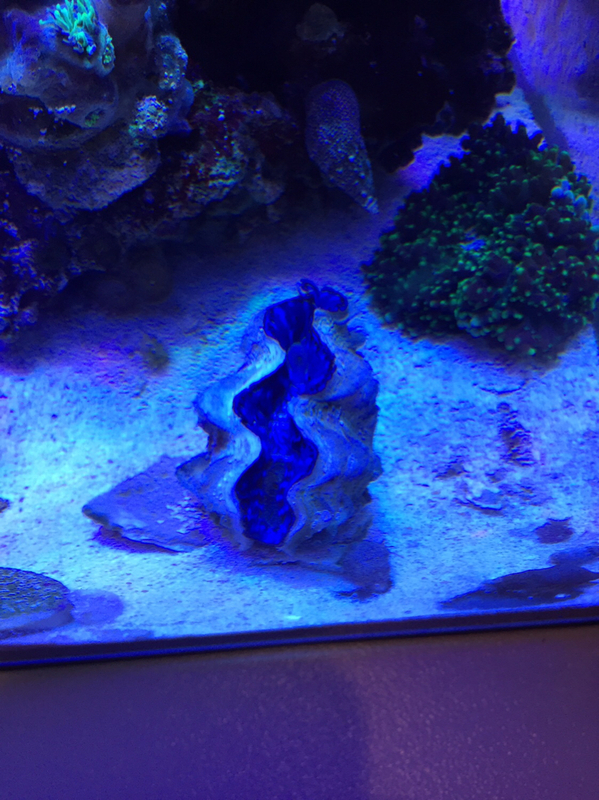 Picked up my first clam from Arnold’s group buy. 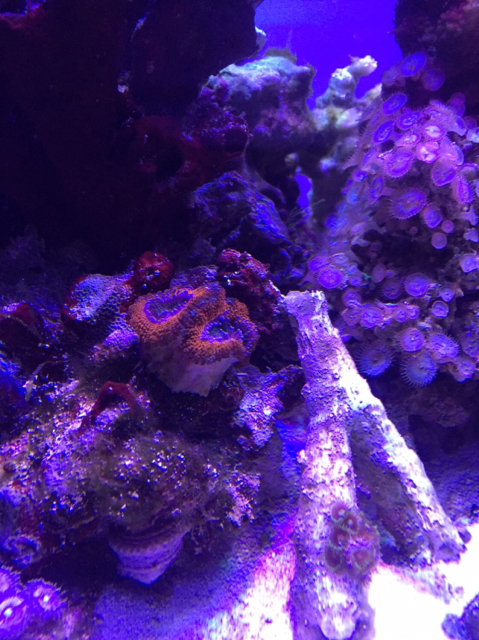 It’s still acclimating to the tank, sitting on an old dead monticap piece. It’s already starting to attach. It’s not open very far, but is reactive to light/shadows when the fish swim over. 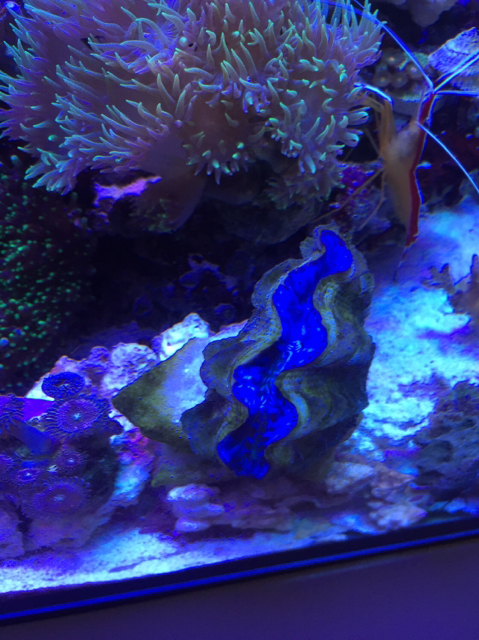 For the clam experts out there, will it just take a week or so for it to settle in and extend more fully? Not a clam expert but it took mine 2-3 months to have its foot fully attached and the most open its ever been. One thing I noticed while cleaning the tank is if sand got into it, it would take a big gulp of water and shoot the sand back out. How responsive the clam is usually what I use to indicate its happiness. Double check the clam and look for any shells that are pointy-coneshaped on the bottom. Forgot the name but those snails over time will become a predator and eat your clam. it should only take a few days, but check on the bottom and sides for anything bothering it - snails etc... Read up on clam care - lots of info out there. These maximas like alot of light so you should slowly move it to high light on rockwork. Thanks Arnold. I read a lot before deciding to buy and have been reading up more over the weekend. I’m a little paranoid now about pyramid snails but don’t want to handle the clam too much to check. I gave it a couple of good scrubbings with a toothbrush and rinses with clean salt water before putting it in the tank. I was afraid to dip it because the information out there wasn’t great on any effects dips might have. I’ll keep an eye on it. May try to move it to a lower flow area when I move it up in the tank next week. You can do a freshwater dip (match temp and ph) but I wouldn't do it unless you are seeing signs of distress. 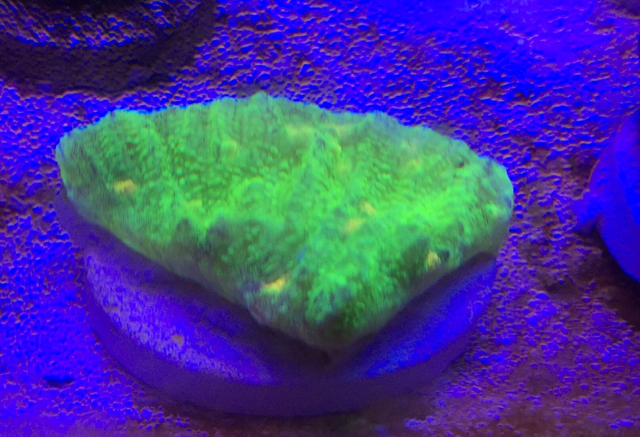 So, it’s been a few weeks post the frag swap. 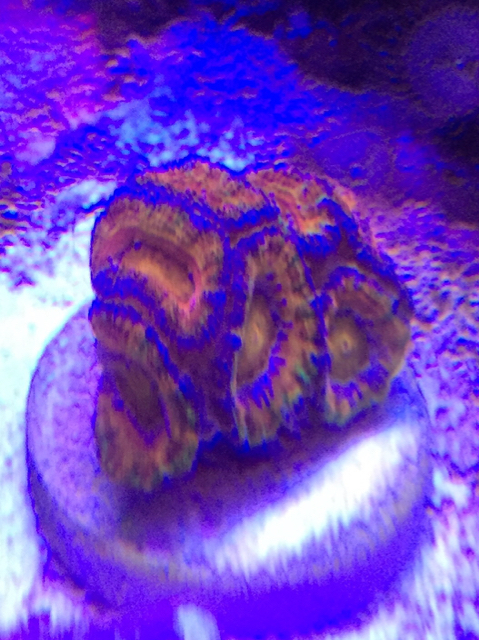 My clam had attached to and old chunk of coral. It’s reactive to shadows. Just wondering if it’s supposed to extend more fully? The mantle never extends really far out of the shell. I put it up on another piece of rock this weekend and will gradually move it higher. 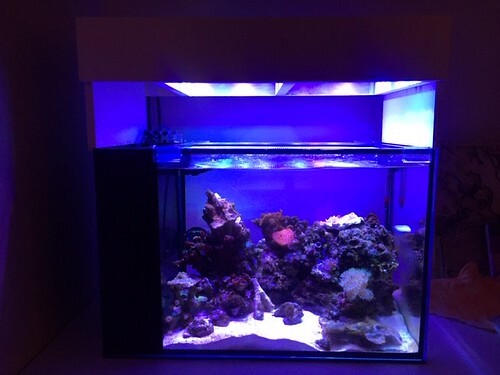 For those that have kept clams, does more light = fuller extension? It’s not receded in the shell, I just keep seeing pictures online with really extended mantles. Running LEDs, tank is 12” deep and lights 6” above water. I can’t crank them up much more because my LPS started bleaching from too much light. I only had one but it was only a few days before it was completely out. Way more than what you’re showing. I’m not sure why yours wouldn’t be though. Check if anything is touching it or if the flow is too strong? Normally it would be extended over the shell. Another good sign to see if it is growing new shell, it would be very white and clean. Maximas are high light clams so I would its ok by now to move it higher in the tank for more light.